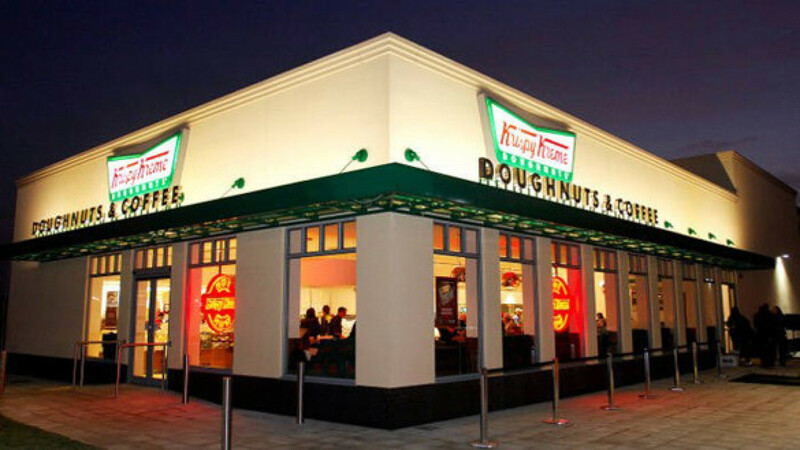 Thursday will see the opening of the first of several Krispy Kreme outlets in Moscow. The first Russian Krispy Kreme doughnut cafe, a franchise managed by restaurateur Arkady Novikov, will welcome its first customers on Thursday in an iconic location on Nikolskaya Street, a walking distance from Red Square. A 250 square meter flagship coffee shop has a doughnut theater, where customers can see the entire baking process, and a traditional sign in the window, which lights up when a new batch of doughnuts is prepared. 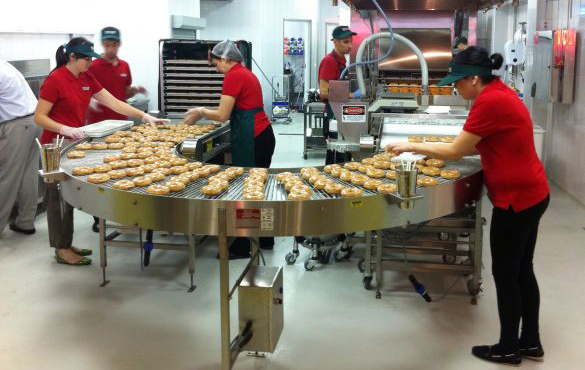 Employees baking Krispy Kreme doughnuts on Tuesday at Novikov’s yet-to-be-opened franchise in Moscow. Novikov Group, which has an empire of more than 50 restaurants in Moscow, London and Dubai, have invested $10 million in this franchise, which also includes a doughnut factory in Moscow, built to cater to future outlets that do not have their own production line. “The franchise is a result of five years of hard work. We'll do all we can to provide the best service, doughnuts, coffee and other drinks. We represent a large company, and it is our responsibility to make sure we do it well,” Novikov said. Krispy Kreme's international president Jeff Welch said the company “found a perfect partner in Arkady Novikov,” because he understands the Russian customer and their taste. The Moscow shop will sell doughnut flavors not available anywhere else, and select coffee beans “that appeal to Russian taste,” because “coffee goes great with doughnuts,” Welch said. “You'll see more and more varieties catered for the local taste and using local ingredients, to celebrate local Russian holidays and Russian special occasions,” he added. Krispy Kreme joins the fight for customers in the U.S.-dominated Russian fast-food market, which grew 18 percent last year and is set to expand 7 percent annually for the next three years, RIA Novosti reported. 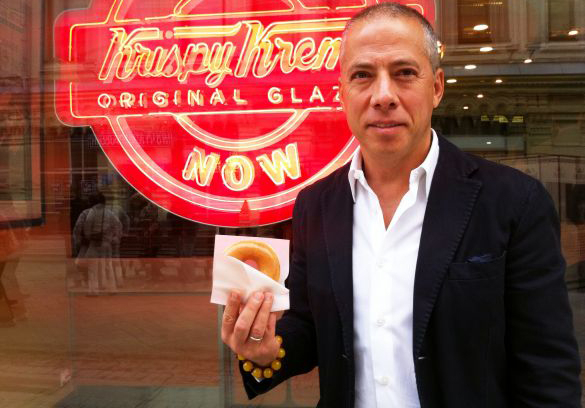 Restaurateur Novikov holding a doughnut at his Krispy Kreme franchise. Among all BRICS countries, Russia has the highest share of households with an annual disposable income of more than $10,000 — 86 percent — which provides immense opportunities for Western companies facing stagnant demand in developed markets, Marketwire reported. Taking advantages of the consumer power in Russia, some fast-food chains set their prices at 20 percent more than it would be in the U.S. to offset import costs, the Financial Times reported. There have been health concerns connected to the fast-food invasion in Russia, with the country's chief public health official Gennady Onishchenko saying last year that fast food was “not a good choice of a meal” for consumers. Russia is the 23rd country to welcome Krispy Kreme. Five more shops are scheduled to be opened in Moscow in the next few months and possibly more if good locations are found and if Muscovites like the doughnuts, Novikov said. Krispy Kreme will compete against its American rival Dunkin' Donuts, which first arrived in Russia in 1996, left in 1999 and came back to the local market in 2010. Correction: In an earlier version of this article, a photo caption incorrectly indicated that the first Krispy Kreme store in Moscow would open on Friday, instead of Thursday.